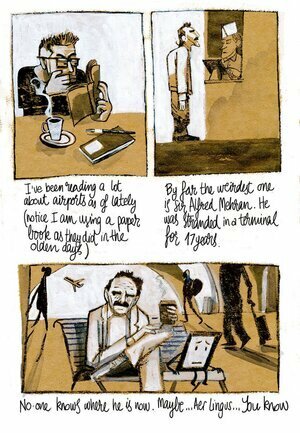 Kilkenny-based illustrator and creative professional Alé Mercado has misplaced his eBook. Or more specifically, he did so aboard an Aer Lingus plane. He’s not best pleased about it, to be honest, and has expressed his growing frustration in an ongoing series of illustrations charting his epic voyage to regain his reader. …to his acceptance of the scale of the quest that awaits him to regain his precious. And thoughts of how/where the ebook is coping with this transitional period in life. No word yet, as to whether or not his book has been found. Posted in Misc and tagged ale mercado, Illustrations at 10:55 am on October 6, 2016 by Broadsheet. Jesus lad, if you’re that careless with the thing…. Many’s a kid would do anything for one and would treasure it. Hi e-book is with the Holy Grial. Whatever that is. Wow… this whinger really needs to get some actual problems in his life. 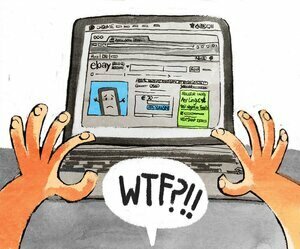 Thanks Broadsheet for sharing the story and thanks guys for your comments. I agree, loosing the e-reader (thanks for the clarification, Derek) is completely my fault (and a quite stupid mistake to make, thanks Spaghetti Hoop). I don’t think it is good enough and want to do something about it. That’s all. If I manage to influence a change in Aer Lingus with this regarding their Lost Property policies, I promise Conor McG that I’ll find an actual problem to fight. That would be nice. If the customer service is that poor, how safe can flying with them be ? Agreed. Why bother with these idiots though? We all loose things from time to time. It’s usually as a result of carelessness or stupidity, because we are a careless and stupid species. If you do have the good fortune to be reunited with a lost item, well and good and indeed, thank you very much to whoever returned it, be they a stranger or a company providing you with a service. You have no right to complain that a company can’t miraculously return your lost items at the drop of a hat. It might make good comic fodder for you, but don’t expect a shred of sympathy. *Lose, even. Though I’m sure we’ve all loosed things we’d rather not have too. Thanks Old Boy. 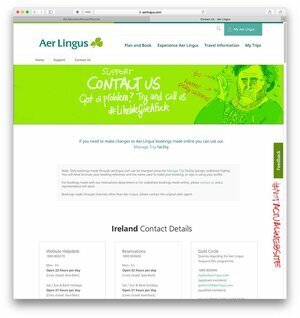 If I may, I am complaining about Aer Lingus making it some extremely difficult to even try to recover it. You are right, they are under no legal obligation to keep or return items. If they did, I would try to get them to change their Lost Property policies using the National Consumer Agency. Not the case. KLM are not saying they’ll perform a miracle, they are saying they’ll try their best. In my book, that’s good service. For years I have been choosing Aer Lingus over other airlines in the belief they would go that extra mile if anything ever arise. It has been very disappointing (so far) to see how little they care. Touché :-) It was intended to be tongue in cheek. Hope you get it back Alé. Thanks Steven. Difficult at this stage. 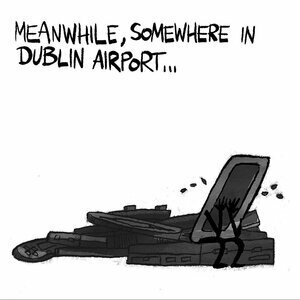 But would be happy if they change their ways at Art Lingus when it comes to dealing with lost property. Love your drawing style. 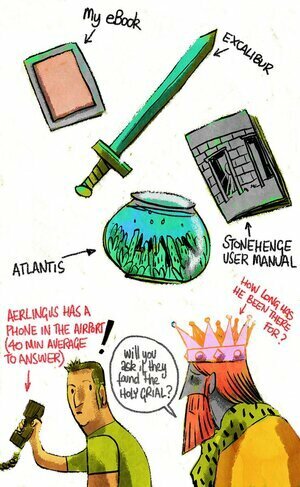 The face on the aer lingus website is class and the colouring on those 3 panels at the end struck me for some reason. Ale, lovely to be chastised by pseudonyms sitting on the sniffy moral high ground. None of them have ever lost anything (because they are so sensible in comparison to you obvs). Apparently you have no right to whinge (said he whingeing), have no right to complain (said he complaining) and don’t expect a shred of sympathy either because, well, we are a stupid species (says he speaking for himself). Jesus Christ Ale, the pious, humourless tw*ts one does find on Broadsheet! Surely it can’t be that hard for an airline to find something that gets left on a plane. Doesn’t the plane get cleaned / checked even a little ? People leave stuff on planes all the time, just like they leave them in hotel rooms – also a confined space that empties its occupants regularly. Aer Lingus used to have such a strong image as an Airline who gave a crap. My son left his iPad on a Ryanair flight from faro back to Dublin last month. One phone call to Ryanair later I was given the number of greencaps, the company that cleans Ryanair planes on arrival. One phone call to greencaps later and I was reunited with said iPad ( picked up from their Dublin airport office ) – EASY McPEASY. Johnser, you are absolutely right. I am not sure if they have stopped giving good service or if it was always just as bad (covered by excellent marketing campaigns maybe?). Buckfastmonkey, that was EXACTLY what I was expecting it would happen. A month on and I still don’t know if they know what happens to lost property there… or even worse, if they care at all. Thanks all again for commenting.